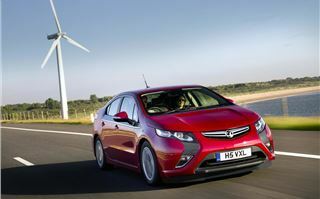 Honest John applauds the Vauxhall Ampera. 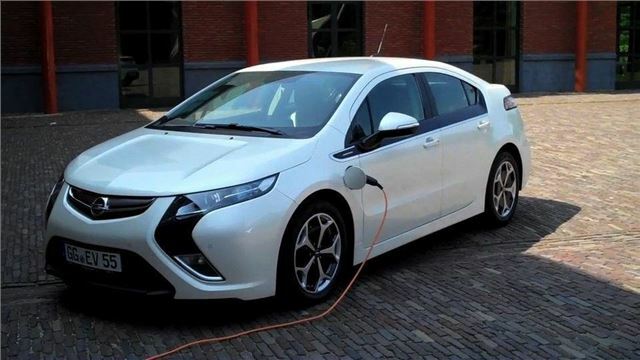 The first electric car with a petrol engine. Now that it’s climatically correct to switch to an electric car a new form of mental illness has been diagnosed. It’s known as ‘range anxiety’. Will your clean green motor actually get you to your destination? And it certainly won’t if that happens to be 300 miles away. You’ll be forced to stop three or four times (or more) to literally recharge your batteries. Of course, this isn’t a problem if an electric car is used appropriately, which is for short runs in town or in the suburbs where electric motors make far more sense than internal combustion engines. And statistics show that 80% of all car journeys anyway are less than 50 miles. But what about that remaining 20%? This is where anxiety starts to nag. 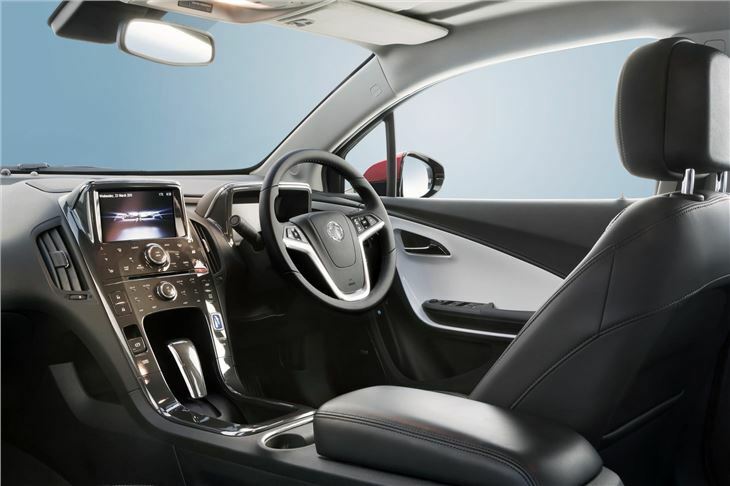 Where the electric car driver watches his dashboard rather than the road, desperately switches off the heating, the air-conditioning and the radio and becomes the head of a crocodile of cars like an electric milk float at the end of its rounds. What if you have an early morning journey to catch a plane, you’ve been charging your car using cheap rate overnight electricity imported from France and there’s a power cut (which seems increasingly likely in years to come). You may be saving the world (though even that is now in doubt), but you won’t be going anywhere. One answer is to get a hybrid (like my dad’s) that is really a means of recuperating lost energy to get the most mileage possible out of fossil fuels. But they don’t go very far on electric power alone. Just a few miles before the power station under the bonnet has to kick in and both drive the car as well as generate more juice for the battery. A better answer is an electric car that also has a petrol engine. The one you see here. 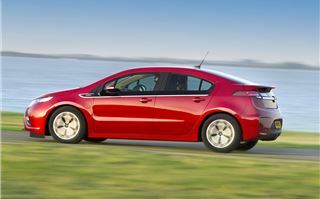 The Chevrolet Volt variously rebadged the Vauxhall or Opel Ampera. Unlike a hybrid, this actually has three motors: A 1.4 litre 86PS Ecotec petrol engine. A 150PS electric traction motor. And a generator that doubles up as a 73PS electric motor. They run either alone or in various combinations assisting each other and generating power. 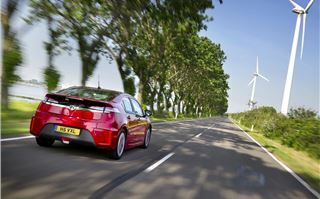 But unlike a hybrid, the main motive power comes from the electric traction motor even when the petrol engine is turning the generator. A 316volt 288 cell, liquid cooled lithium ion ‘T’ shaped battery sits in the centre of the car and under the rear seats (which is the safest place for it). As the battery begins to die, the petrol engine starts up, turning the generator that then feeds power into the electric traction motor. At higher speeds, when there’s some charge in the battery, the generator switches to motor mode to assist the traction motor. And at very high speeds, or while climbing mountains, the petrol engine partly powers the generator and partly helps to drive the car through its epicyclic gearbox. The driving experience when the petrol motor is running is a bit like a hybrid, but more so because engine revs have less relationship to the speed the car is actually going. The feel of the car on the road is a bit like the Honda FCX Clarity. You’re aware of the weight of the 195 kilogram battery. But it rides serenely and grips well enough on corners. You can control the modes. 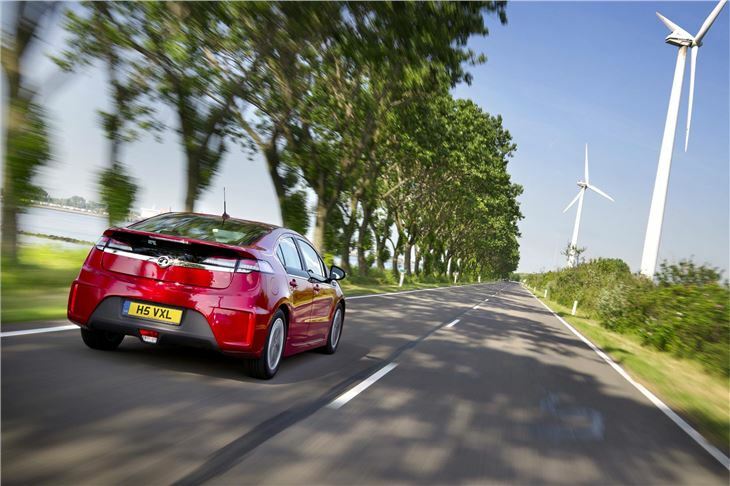 ‘Normal’ is as the name implies normal electric drive. ‘Sport’ puts both electric motors in drive mode. While ‘hold’ conserves the battery by switching the petrol engine on so you can be sure of having enough electricity to enter and drive in an emission-free zone. But whatever mode, there’s no lack of grunt. Sixty miles an hour comes up in nine seconds, top speed is a hundred miles an hour and range is 360 miles before you have to put more petrol in. A full battery charge from discharged state takes 4 hours and can be programmed for off peak rates. You get a 20-foot cable with the car. And CO2 emissions with the engine running are just 40 grams per kilometre. Luggage space is a fairly meagre 300 litres, extending to 1,000 litres with the rear seatbacks down. Leg and headroom is fine for four passengers. There’s no centre rear seat because that’s where part of the battery sits. 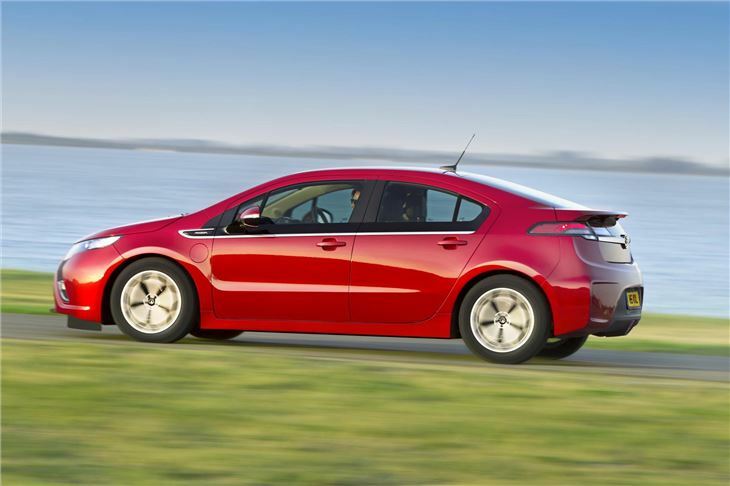 You can buy an Ampera from April 2012, and you’ll benefit from a £5,000 government grant that brings the price down from £33,995 to £28,995. As a company driver, for the first year at least, you’ll pay BIK tax on just 5%, which is BIK on £1,700. 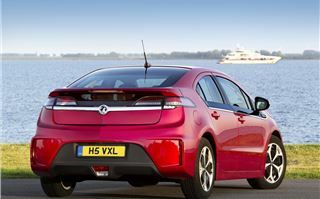 Whatever the badging, ‘Volt’ or ‘Ampera’, this Ohmer Simpson of a car takes electric cars somewhere they have never been before. The South of France, for instance. You may have to stop a couple of times to fill up with petrol. But you won’t have to plug it in while you force down an extended menu gastronomique. 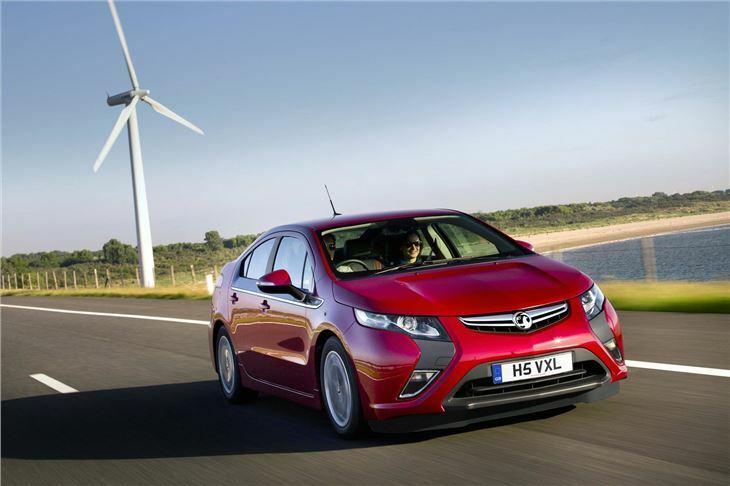 Second Opinion: Road Test of RHD Vauxhall Ampera by John Slavin.